Learn how to display numbers as percentages in Excel and view examples of several basic techniques for calculating percentages in your worksheet. Although formatting numbers as percentages is straightforward, the results you get after you apply the format may vary, depending on whether the numbers already exist in your workbook. Formatting cells that already contain numbers If you apply the Percentage format to existing numbers in a workbook, Excel multiplies those numbers by 100 to convert them to percentages. For example, if a cell contains the number 10, Excel multiplies that number by 100, which means that you will see 1000.00% after you apply the Percentage format. This may not be what you expected. To accurately display percentages, before you format the numbers as a percentage, make sure that they have been calculated as percentages, and that they are displayed in decimal format. Percentages are calculated by using the equation amount / total = percentage. For example, if a cell contains the formula =10/100, the result of that calculation is 0.1. If you then format 0.1 as a percentage, the number will be correctly displayed as 10%. To learn more about calculating percentages, see Examples of calculating percentages. To quickly apply percentage formatting to selected cells, click Percent Style in the Number group on the Home tab, or press Ctrl+Shift+%. If you want more control over the format, or you want to change other aspects of formatting for your selection, you can follow these steps. On the Home tab, in the Number group, click the icon next to Number to display the Format Cells dialog box. 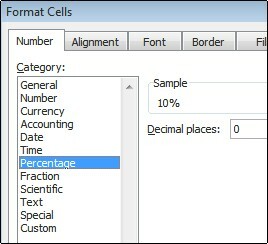 In the Format Cells dialog box, in the Category list, click Percentage. In the Decimal places box, enter the number of decimal places that you want to display. For example, if you want to see 10% instead of 10.00%, enter 0 in the Decimal places box. To reset the number format of selected cells, click General in the Category list. Cells that are formatted with the General format have no specific number format. If you want negative percentages to stand out—for example, you want them to appear in red—you can create a custom number format (Format Cells dialog box, Number tab, Custom category). The format should resemble the following: 0.00%;[Red]-0.00%. 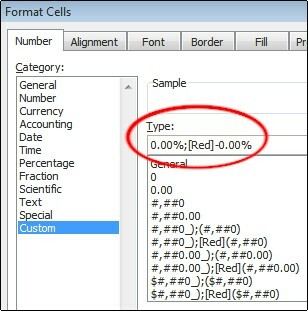 When applied to cells, this format displays positive percentages in the default text color and negative percentages in red. The portion that follows the semicolon represents the format that is applied to a negative value. Similarly, you can display negative percentages in parentheses by creating a custom format that resembles this one: 0.00%_);(0.00%). For more information about how to create custom formats, see Create or delete a custom number format. You can also use conditional formatting (Home tab, Styles group, Conditional Formatting) to customize the way negative percentages appear in your workbook. The conditional formatting rule you create should be similar to the one shown in the following example. 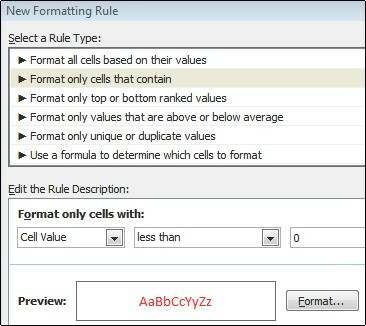 This particular rule instructs Excel to apply a format (red text) to a cell if the cell value is less than zero. For more information about conditional formatting, see Add, change, find, or clear conditional formats. This section shows several simple techniques for calculating percentages. Scenario If you spend an average of $25 on food each week, and you want to cut your weekly food expenditures by 25%, how much can you spend? Or, if you want to increase your weekly food allowance of $25 by 25%, what is your new weekly allowance? Scenario If you purchase a computer for $800 and there is an 8.9% sales tax, how much do you have to pay for the sales tax? In this example, you want to find 8.9% of 800. This formula multiplies 800 by 0.089 (the underlying percentage in decimal form) to find the sales tax to pay. Scenario For example, if a student scored 42 points correctly out of 50 on a test, what is the percentage of correct answers? In this scenario, if the number in B2 is points answered correctly and the number in C2 is the total points possible, you can type the formula =B2/C2 in D2 to find the grade. Scenario For example, the sale price of a shirt is $15, which is 25% off the original price. What is the original price? In this example, you want to find 75% of which number equals 15. This formula divides the sale price by the percentage paid to find the original price. Scenario For example, the earnings for your department are $2,342 in November and $2,500 in December. What is the percentage change in earnings between these two months? To do this task, use the subtraction (-) and division (/) operators in a single formula.